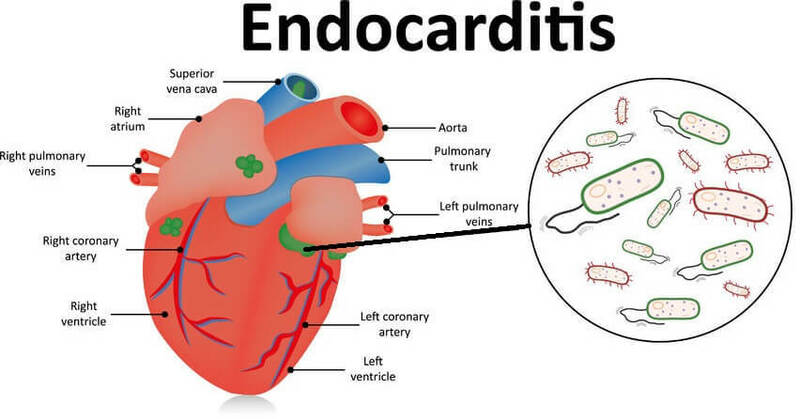 Infective Endocarditis (IE) is a type of endocarditis (swelling of the heart valves and the endocardium) caused by infectious agents like bacteria or fungi . The incidence of IE ranges from 1.7-6.2 cases per 100,000 sufferers ever year . Rate is higher in intravenous drug users. IE is 3 times more common in males and has a high prevalence in elderly patients. It is comparatively rare in children although its incidence may be on the rise. The incidence is low during pregnancy. Acute bacterial endocarditis (ABE) – It is possibly caused by Staphylococcus aureus and stays severe for a few days to weeks. It arises suddenly. Subacute bacterial endocarditis (SBE) – It is often caused by less harmful variety of streptococci and progresses gradually over a few weeks to a few months. According to results obtained from cultures, it is classified as Culture-positive and Culture-negative. The latter is most commonly caused by prior administration of antibiotics. This arises when the infectious organism is supposed to be transmitted in hospitals and other health care settings (healthcare associated endocarditis). The signs may develop gradually (subacute) or rapidly (acute). It is typically characterized by fever, which persists for several days before the development of any other symptoms. A physical exam is performed to detect clinical features such as a possibly enlarged spleen and splinter hemorrhages in the fingernails. Abnormal heart sounds, or murmurs, may be detected with a stethoscope. Eye exam investigations may reveal Roth’s spots (retinal bleeding). Arthritis is generally asymmetric in subacute IE and as many as 3 joints are affected. In 2.5–31% of all cases of IE, diagnosis is often delayed due to negative blood cultures. Vascular phenomena: mycotic aneurysm, septic pulmonary infarcts, major arterial emboli, Janeway’s lesions, conjunctival haemorrhages and intracranial haemorrhage. Immunological phenomena: Osler’s nodes, rheumatoid factor, glomerulonephritis and Roth’s spots. Those requiring intravenous antibiotics need hospitalization. Prolonged, high-dose antibiotic treatment is required for bacterial removal. Antibiotics are usually administered for 4-6 weeks, based on the particular form of bacteria. Blood tests can help physicians chose the right antibiotic. Damaged heart valves may need replacement by surgery. Earlier, anticoagulants were used for treatment of IE. The use of anticoagulation agents is a matter of debate today (possible risk of neurological complications). Empiric therapy is not generally used in suspected cases of subacute endocarditis until blood cultures identify the etiology . In people with a prior history of IE, continued medical follow-up is recommended for better management. When treated early, the outcome is good. If undiagnosed and untreated timely, heart valves may suffer damages. Prognosis also depends on rate of cure and mortality. Preventive antibiotics , recommended by The American Heart Association, for individuals susceptible to IE before some dental procedures and surgeries on infected skin, respiratory tract etc. The ICD9 codes for this disorder are 421.0 and 420.1.